Last mile business reporting tools are the reports we use to manage business performance at the front lines. 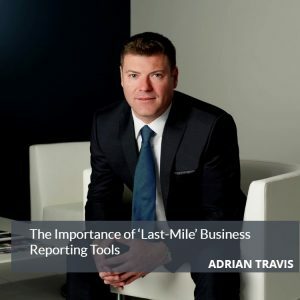 Reporting typically fails to go the ‘last mile’ because it resides in dozens of different systems, requires manual creation and editing, or just isn’t disseminated to the right people. This results in the department being starved for actionable information. Many end-users also don’t have the right access rights or ability to see the upstream and downstream implications of how other departments interact with theirs. So often our clients cannot unlock the value of their ‘enterprise’ system investments because there isn’t a standardized version of business performance that goes the final mile. Often the data is housed in several systems. Modern businesses have many systems that aren’t talking to one another and this isn’t going to change anytime soon. There’s always a need for business intelligence tools that help to join the dots. Most ERP systems are great repositories for data, but are poor at displaying actionable information. If you’d like to manage the detail and understand the business, you need a good refresh rate on your data. Too often clients prefer to take the easy way out and report on an indicator monthly, and then the information is stale, or it’s impossible to speak to the history of what occurred. I recommend daily or weekly on every indicator you could possibly imagine. Reports are going to lose roughly half the population’s interest if they consist of just a set of numbers. When colors and trendlines and graphs illustrating performance to tolerance are included – it vastly increases the adoption rate and managerial comprehension of the tool. Determine who sees it – like anything, information needs to be directed at the right person accountable to the indicator. For example, financial indicators irrelevant to the floor-level manager or supervisor might not be meaningful. As well, executives are likely to want a different span of information than a manager or director immersed in a departmental process. Often client organizations are guilty of changing the targeting and the indicators on a monthly basis or making them up as they go along. Ideally your business indicators should be static and fundamental so that staff knows what to expect, and what the targets and tolerances are going to be. Don’t measure everything – it’s best to refine and curtail key performance indicators so that they remain… well… KEY. There’s no ‘yellow’ indicator in business, otherwise you are unwittingly lowering the bar to the lowest ‘yellow’ number acceptable. In our world at Trindent, it’s either Green or Red. The report itself is useless, it needs a human being to talk about what happened and what’s being done to recover. Too often we as executives expect the report to do the talking, but a critical leap in business understanding is achieved when people recognize business challenges proactively and come to the table ready to discuss why it happened and what they’re doing to fix it. Similarly, I’ll use a few pictures to illustrate what happened to in the aviation world over the last two decades, as it’s near and dear to me. 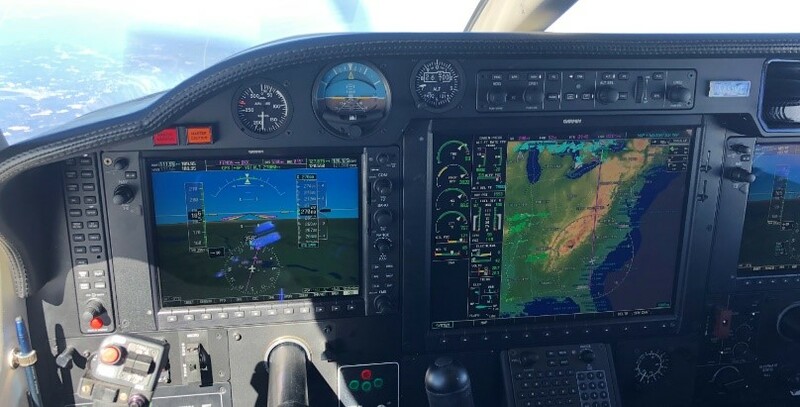 On the top is what we refer to as a ‘six-pack’ of analog instruments, and on the bottom is a modern, ‘glass’ computerized flight deck that brings a plethora of information to the pilot in real time. 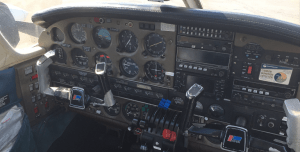 I first flew the aircraft at the top in the 1990’s – the second picture is from a flight I took earlier this month. What you’ll agree with is that neither of these reporting tools are useful to an aviator if the pilot doesn’t maintain a diligent scan of what the tools are telling him/her and make the right judgments and decisions promptly at every phase of the flight. I thought this was a great analogy and illustration of what good reporting looks like and how human beings are still fully required.